The only product in the current market which can virtually eliminate urine splashback. 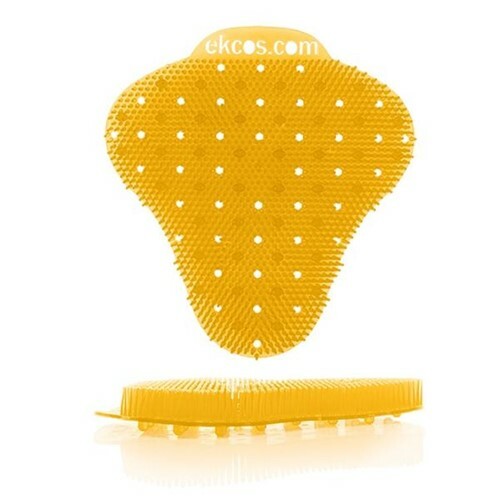 By having Ekcoscreens in your companies urinals, you will reduce the number of customer complaints about bathroom quality and lower overall cost of operation. Ekcoscreen is not only reasonably priced, but a significant cost-saver. Each screen lasts over sixty days - more than twice as long as any comparable product. The use of our 60 day PLUS Ekcoscreen is an ecologically responsible choice, Ekcoscreen has a smaller carbon foot print than the shorter life span screens that constantly have to be replaced, Ekcoscreen complies with California and federal VOC regulations. Lasts twice as long as other screens on the market. 60 days PLUS. More days depending on traffic, Ekcoscreen can last longer that 60 days depending on use.